Steve Gundrum was grinning on Thursday when he climbed out of a Toyota some might call a cross between a zippy scooter and an eco-friendly electric car. Gundrum was among the TED Conference attendees who test drove one of the company's i-ROAD prototype "personal mobility vehicles" on a course set up in the basement of the Vancouver Centre, where the gathering took place. The second seat in the small, electric two-seater vehicles is likely to be better used for backpacks or grocery sacks than passengers. 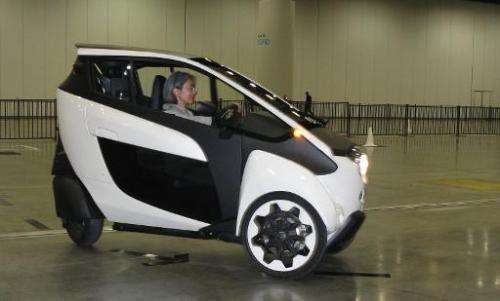 Steering was accomplished with the single rear tire of the i-Road's three wheels, meaning drivers needed to turn a few heartbeats earlier than in a typical car. "It's easy and intuitive," Gundrum said. "It's kindred to a motorcycle, but it's really a very small automobile," the California man added. Toyota brought the prototypes to TED to find out how the gathering's attendees see the future of mobility, said Jason Schulz of Toyota Motor Sales USA. Schulz pictured i-Road being used for everyday short trips—such as getting to train stations, darting to markets or commuting to jobs. "Look at San Francisco or Manhattan where parking is so constrained," Schulz said. "You could get around with this and then park a couple of them in the same space as a typical car today." The i-Road weighs about 660 pounds (300 kilos), has a top speed of 35 miles per hour (56 kilometers per hour) and a range of about 30 miles (48 kilometers). It recharges in three hours and plugs into standard outlets. Gyroscopes and sensors for balancing the three-wheeled vehicle result in it leaning through turns similar to the exhilarating way motorcycles take curves. "In the 20 years I've been in the car business, this is the most fun, interesting ride dynamic I've ever had because of the rear-steer and the active lean system," Schulz said. "It is just a total blast to drive. We have seen so many 'Tedsters' come out of the car smiling and happy." The vehicles are being tested in Tokyo, Silicon Valley and via a carsharing program in Grenoble, France. Toyota has yet to figure out how it will price i-Road, but Schulz said it will need to be attractive enough to compete with new cars. The issue with these cars is the assumption that 50-60 kph is enough, when in reality you'll be stranded in your suburb because the main connecting roads are 80 kph and it's very unpleasant to trundle along with the rest of the traffic in a tiny plastic roadblock that is only barely able to reach the speed limit even in a 60 kph zone. There are already small cars similiar to this on the market, (class L6e and L7e in the EU) and everybody hates them because they're slow, flimsy to drive and generally useless annoyances to all the other road users, and the only users are rich kids who haven't yet gotten their proper drivers lisences. For distances below 10 km it's far easier and convenient - and cheaper - to take a bicycle or a scooter. I was in my civil service time (which was 2 years in exchange for refusing to do 1.5 years of military service). So I was thinking: If I save the 450 Deutschmarks per month I get I can just about afford this thing by the time I have done my time. But after 2 years you suddenly realise how much hard work went into that little money - and that I didn't really need a car for going to uni. This would have been for local use: getting from the suburbs to city center and back...using railways for the occasional long distance trips (which is perfectly feasible with a railway system like in europe). In the end I opted for a bicycle, as the city I went to uni at had (and has) the best tramway, bus, and cycle-way system in germany. A car would have been pointless. Ever drive a forklift? This is going to get people killed. Most people have never driven a rear steering vehicle and don't know the peculiarities of how they drive. A good example is the fact if you get too close to something you cannot steer away from it but a tiny bit at a time because the rear end will swing toward what ever it is your too close to.